From maple cotton candy and popsicles to barrel-aged malt vinegar and apple brandy, there’s nothing you won’t find at the Bennington Vermont Farmers Market! As August 5-11 just commemorated National Farmers’ Market week, we thought this would be the perfect time to highlight one of Bennington’s most flavorful attractions, our very own summer farmers’ market in Southwestern VT. Founded in 2002, the Bennington Farmers’ Market is producer only, meaning customers purchase goods directly from the farmers and producers themselves. Organic Veggies abound at True Love Farm at the Bennington Farmers’ Market. 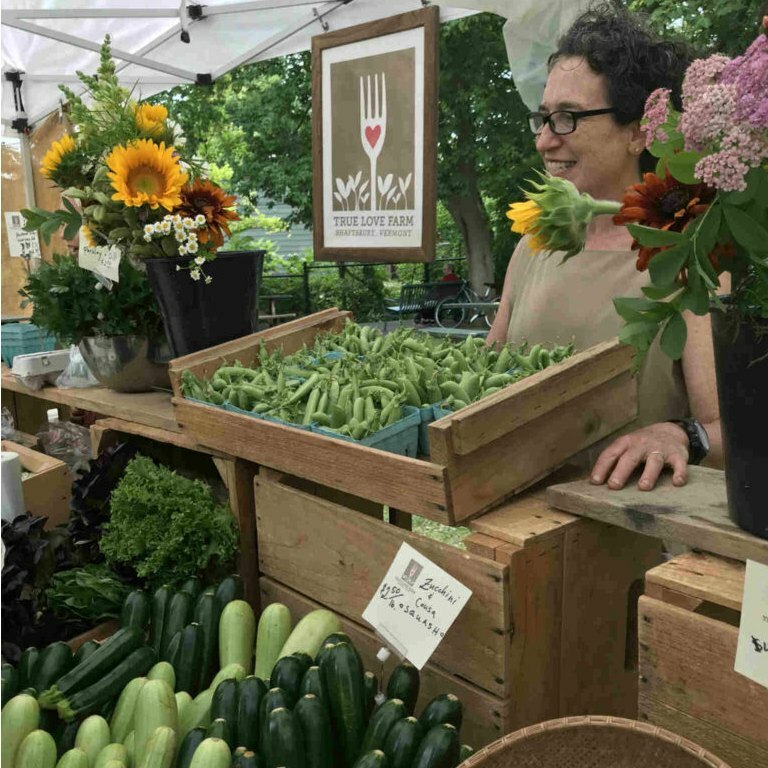 Located just one mile away from our historic Vermont Bed and Breakfast, The Bennington Farmers’ Market is in full swing on Saturdays from 10 am-1 pm at 150 Depot Street, Bennington Vermont. So wake up at our cozy bed and breakfast to a complimentary full country breakfast before heading to the farmers’ market. What better way to experience authentic Vermont than with an afternoon at the Bennington VT Farmers’ Market ― complete with a delectable assortment of local produce, savory baked goods, and quality crafts for the whole family to enjoy. With fresh products that promote the local versatility of Bennington, the market is the perfect place to interact with folks from all over the Northeast and support local vendors who work to make your summer a memorable (and delicious) experience. You won’t want to miss Nana Kay’s artisanal old fashioned baked goods, tender potatoes from the Ruocco Family Farm, or any of the many fabulous venders that will be appearing at the market this summer. And while you’re scoping out the various tents and scanning the scrumptious array of fruits and veggies, enjoy the harmonic melodies of local musicians filling the air with the sounds of summer. Take your pick of the bunch. 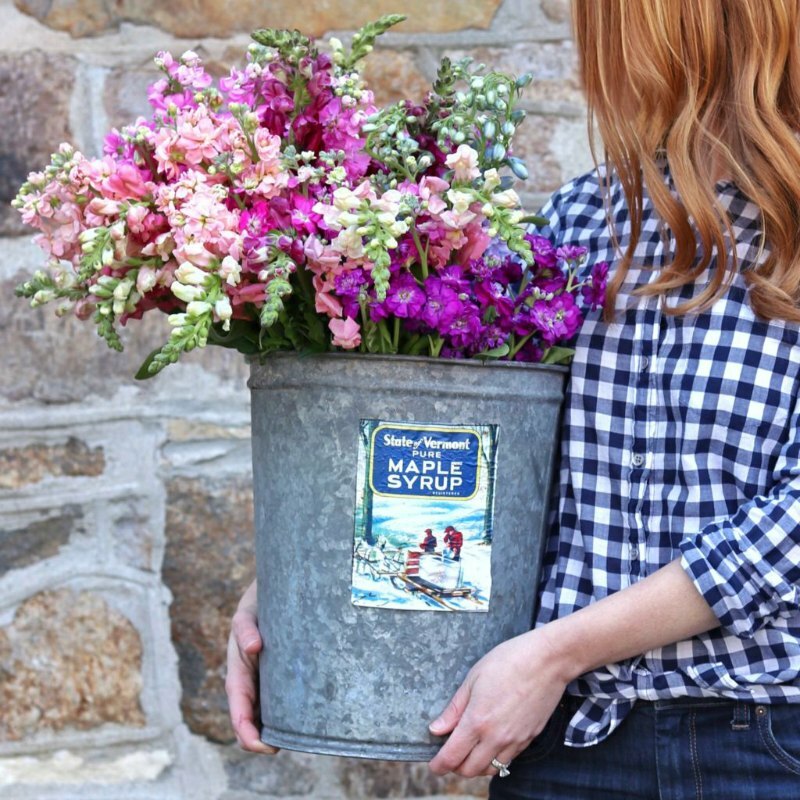 Fresh flowers in an old maple syrup bucket at the Bennington Vermont Farmers’ Market. Load up with fresh wholesome crunchy snacks for the ride back home at True Love Farm. And for locals, check off your grocery list with all of the ingredients to an enriching summer experience at The Bennington Farmers’ Market. You’ll find everything you need to whip up a delicious summer feast, get started on your fall home décor, or pick up the perfect accessory for your next summer bbq! So start your Saturday right with a delicious breakfast at The Four Chimneys Inn, lace up your walking shoes for an early morning stroll in Downtown Bennington, and kick off your weekend at the cultural hub of Bennington County. And whether it’s a bagful of green veggies or simply a good time, you might just walk away with something truly special. Wrap up your Vermont Fall Getaway plans around one of the many Bennington attractions including the fabulous Bennington Farmers’ Market. 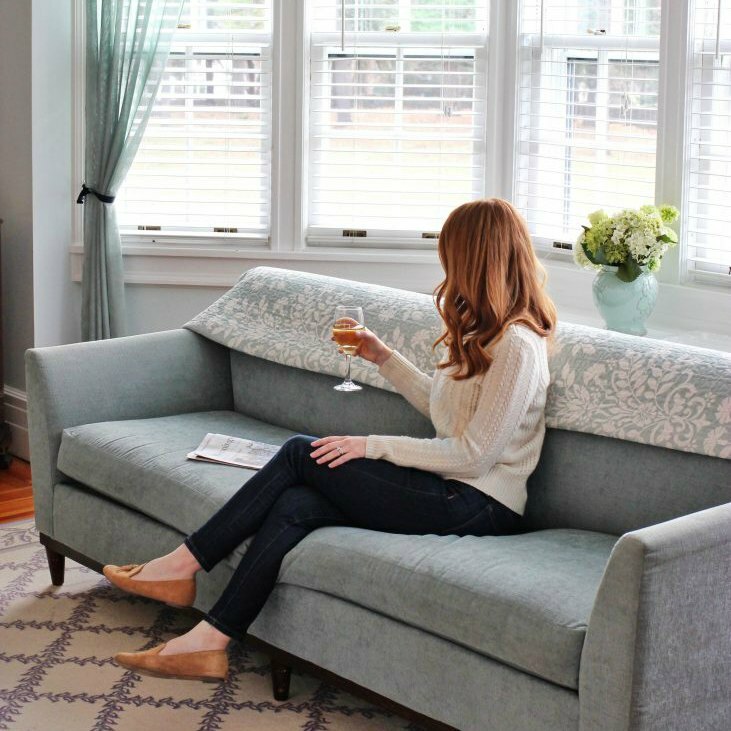 And don’t forget to save time to just relax at our historic Vermont inn. Find your favorite room and book now.